Commitment to community. Outstanding service. Excellence in education. These are the characteristics that members of the Lewis Award Committee use to evaluate finalists for the annual Monsignor Gerald L. Lewis Award for Excellence in Teaching. 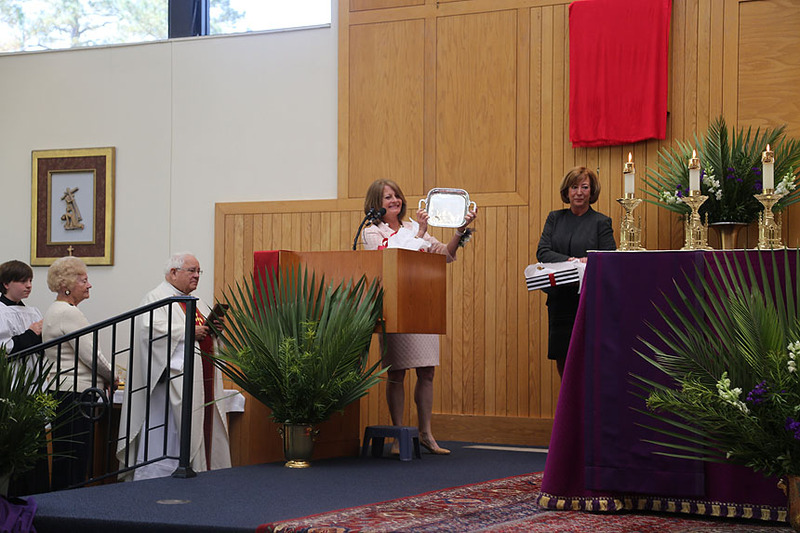 They also happen to be the words that friends, colleagues and students use to describe Laurie Huger, third grade teacher at Our Lady of Lourdes School in Raleigh and the recipient of the 2018- 2019 Lewis Award. 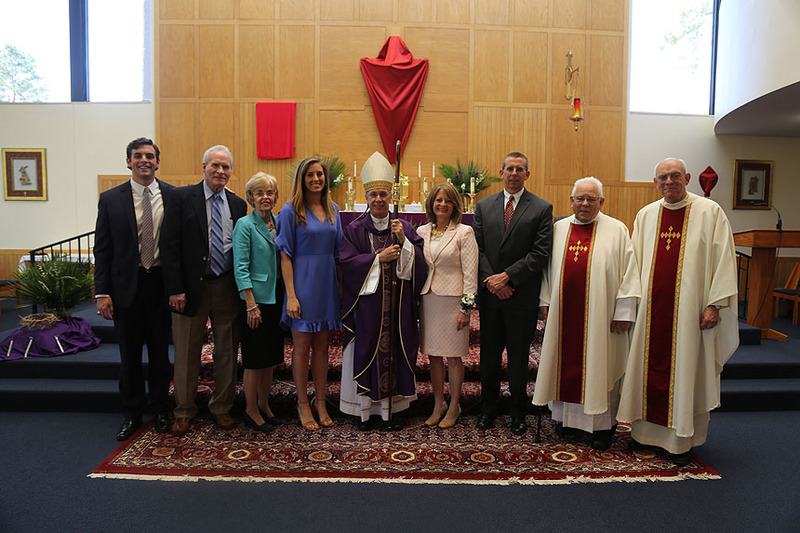 Huger was honored April 10 at a Mass held at Our Lady of Lourdes Church. Bishop Luis Rafael Zarama was principal celebrant and Monsignor Gerald Lewis, for whom the award is named, was homilist. Monsignor Jeffrey Ingham and Father Mike Schuetz, both of Our Lady of Lourdes, concelebrated. 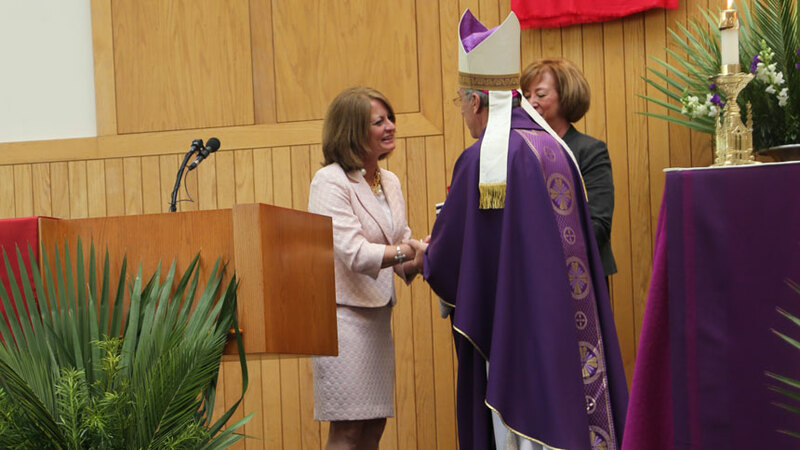 Love was felt and heard throughout the Mass, which welcomed the entire school community as well as friends, family, Lewis Award Committee members and diocesan representatives including superintendent Dr. Michael Fedewa. Nowhere was that love more evident than through the voices of the third-grade choir. Led by Huger and fellow teacher and organist Christine Brennan, the school choir serves at weekly school Masses as well as special Masses such as this one. Although she sat in a place of honor at the front of the sanctuary rather than her normal place with the choir, it was evident they wanted to sing their best on her special day. Their joyful voices filled the sanctuary with the sounds of some of Huger’s favorite hymns. In his closing remarks, Bishop Zarama thanked the choir for their singing and compared them to the internationally acclaimed Vienna Boys Choir. Grochowski continued by giving examples of the many other places Huger creates community, including as coach of the Lourdes lacrosse team and co-chair of the One Love Lacrosse Play-Day. The annual play-day is a regional lacrosse tournament which raises funds and awareness for the One Love Foundation, an organization dedicated to teaching young women about healthy relationships. Every person in the packed sanctuary stood to applaud as Huger stepped forward to accept her award. When the applause quieted, Huger immediately looked to her right, toward the third-grade choir. She gave them a smile and a thumbs up, showering them with praise and gratitude before giving her remarks. Looking into the front pew, where her family sat, she reminisced about a time when she asked her parents why they made the sacrifice to send her to Catholic school. “Among many reasons, my mom summed it up by saying, ‘It just felt like home,’” Huger said. She thanked her parents and continued to express her gratitude. She thanked Brennan for making her day brighter as her ‘grade partner’ for the entirety of Huger’s 17-year career at Lourdes. She thanked her assistant coach, Sister Mary Jo Ely, for keeping her calm and for sprinkling the athletes with holy water before tough games. She also expressed gratitude for the opportunities that being a Catholic school teacher gives her and for the moments that touch her heart, such as starting each Friday morning with happy tears when choir leads the school in worship. As she concluded her remarks, happy tears were shared throughout the sanctuary. “I thank all of you for this award, but I only accept it on behalf of the entire community at Our Lady of Lourdes, a place that will always feel like home,” she said.